As a child growing up in the mid-90s, I loved sports and I loved movies, both loves very near to my heart to this day. During the mid-90s there were a lot of children’s sports movies being released, The Sandlot, The Big Green, Space Jam, Angels in the Outfield, Little Giants. I loved them all. 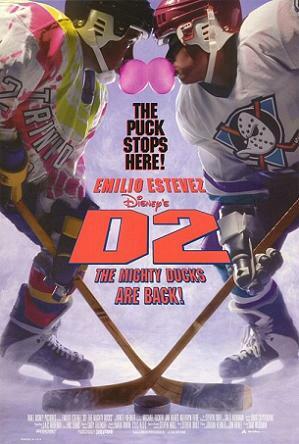 One of my favorites growing up was The Mighty Ducks 1 and 2. I used to watch them all the time whenever it was in cable, almost to the point that it annoyed my parents. Now that I am at an advanced age of 27, I can now look back and realize there were a lot of inaccuracies with these sports movies and none more than D2 The Mighty Ducks. So, the plot of D2 is pretty much this: Gordon Bombay is a player who is about to be called up into the NHL, inures his knee, and instead becomes the coach for Team USA in the Junior Goodwill Games. Who did they recruit to play for Team USA? Why, coach Bombay’s Ducks team from Minnesota. You know, the same Mighty Ducks that backed their way into a Pee-wee hockey league playoffs in Minnesota. You’d think that a country with a proud hockey tradition would have actually gotten some better and more prolific players. Instead, Team USA is full of bumbling players who have a hard time staying in rollerblades. Hockey players are supposed to be graceful on the ice, but these guys make me look like Rocket Richard and this is supposed to be Team USA? Surely there had to be better options. Iceland and Trinidad and Tobago: Hockey Superpowers? When there’s a movie about an ice hockey tournament, you’re going to need a antagonist that is the downright superior team. Is it Canada? Russia? Sweden? No, it’s the hockey powerhouse of Iceland. The same Iceland that is ranked 33rd in the IIHF World Rankings and played their first international game in 1999, five years after the movie came out, losing to another hockey superpower, Israel, 11-0. You’d think at the very least they would have used Russia because of a certain game in 1980. I think the reason why they probably didn’t use Russia was because it was 1994 and Russian-US relations were finally on the mend and something as trivial as this could have upset Russia. I know I’m just grasping at straws here, but it’s just a theory. I n fact, Russia would have been a logical choice seeing as how the Goodwill Games came to be. Billionaire media mogul Ted Turner created the Goodwill Games after the USA’s boycott of the 1980 Summer Olympics in Moscow and the USSR’s boycott of the 1984 Summer Olympics in Los Angeles. So, it would just make even more sense to have Russia be the main antagonist. Just because Iceland has the word “ice” in it, it doesn’t mean they are superior in hockey. Also, Trinidad and Tobago’s hockey team was good enough to make group play in the Junior Goodwill Games. All this despite Trinidad and Tobago not having a national hockey team and only three indoor hockey rinks. In fact, only one professional hockey player has ever come from Trinidad and Tobago, the WHA’s Sam Gellard. “Cool Runnings” had come out a year before D2, so my theory is is that Disney, producers of both films, were trying to still catch that Caribbean feel from “Cool Runnings” as you can see in the video below. In the film, Team USA member Russ Tyler, played by current SNL cast member Kenan Thompson, had a very unique shot called the “knucklepuck”. The puck would rotate end over end without spinning on it’s center. In the Gold Medal game, Iceland did a great job of defending the knucklepuck and blocking his shots, you know something a good defense does.. Team USA really had no answer for Iceland’s defense, except one illegal move. Russ Tyler disguised himself as Goldberg, the team’s starting goaltender, in an effort to trick Iceland. The clever ruse worked as the US tied Iceland on the last second shot (I’ll get to that part later). However, many violations occurred in this play. First, I’m almost positive a player cannot impersonate on player on the ice. Secondly, if Team USA had replaced their goalie, in the instance Tyler for Goldberg, it would have had to be announced. Lastly, Russ Tyler quite clearly ripped his helmet off, if a goalie’s helmet is removed at any point during play then play is whistled dead. So, basically Team USA’s game tying goal should have never counted. Getting back to the last second goal, hockey is unlike basketball and football. In those sports, if you get a shot or play off before the final second ticks away play will continue. However in hockey, a shot needs to be in the net before the last second ticks away. Basically, there is no way Russ Tyler could have ever gotten a buzzer beating shot and there would have been a minimum of 0.1 seconds left on the clock. Before the start of the third period of the Gold Medal game, Team USA was struggling and it appeared as if the vaunted Icelandic team would win the Gold Medal. As they prepared to step onto the ice to start the third, Team USA had changed into Ducks uniforms. WHHAAAA?!?! Those jerseys must have had some magic in it because Team USA roared back on won the Gold thanks to Russ Tyler’s goalie-switcheroo, buzzer beating kuncklepuck. Now, I looked at the NHL rulebook and there is no discernible rule against changing uniforms mid-match, but I’m pretty sure that it would be frowned upon. That always kind of bugged me when I watched this. Now this one I figured out later on in my life, but still an error nonetheless. Now, Icelandic names have suffixes that end in -son or -dottir, meaning ‘son’ or ‘daughter’. For example, if Jon Einarsson had a boy named Olafur and a daughter named Sigriour, the last name for his children would be Jonsson for his son and Jonsdottir meaning literally son or daughter of Jon. Now that the learning lesson is out of the way, we can get on to how D2 messed it up. The star player of the Iclandic team is Gunnar Stahl, a Swedish sounding name. If they wanted to use a Swedish name, then why didn’t they use Sweden as the antagonist and not Iceland. I guess Sweden is too polite to have any real villains. At least the screenwriters got the coach’s name right, Wolf Stansson. So, Wolf is Stan’s son, see writers, do your research on Icelandic names if you plan on using Iceland. The comic relief of the film, Greg Goldberg, is somehow the starting goaltender for Team USA. He’s clumsy, out of shape, and uncoordinated. If this was real life, Goldberg would have a GAA higher than the national debt. Yet, he somehow won a Gold Medal. He’s the Roberto Luongo of D2, a goalie on a good team but his backup is far superior. Meanwhile, Goldberg’s backup, Julie “The Cat” Gaffney, is faster and more coordinated in net, but is not the starter. Coach Bombay sticks by his own guys way too much, I know he and Goldberg go way back, but Gaffney is the superior goalie and a smarter one at that. Of course I may be biased because Gaffney hails from Maine, Bangor, Maine to be exact. On second thought, no I’m not biased, Gaffney was a much better goalie. Growing older has made me much more cynical, but all in all, it is a good movie for kids who love hockey. Just don’t read too much into it like I clearly did.